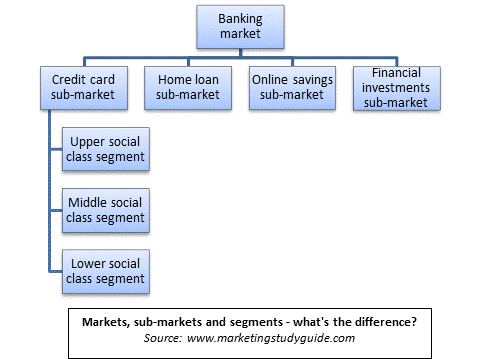 It is important to have an understanding of markets and sub-markets (and the firm’s product-market definition) at the starting point of the market segmentation process. This is because it is a common mistake to ‘segment’ a market based on products, rather than segmenting by consumer group. This mistake usually happens by confusing a sub-market with a market segment. As shown in the diagram, the overall market of interest is the banking market. This overall market could be easily categorized into a number of sub-markets. Then, using the credit card sub-market as a further example, this smaller market could then be segmented using a variety of segmentation bases (or variables). As highlighted in the definition above, sub-markets usually have some unique market aspects. For example, in the credit card sub-market, there are some large specialist competitors, such as American Express and Diners’ Club. These are significant players in this sub-market, but do not tend to significantly compete in the broader banking market. Credit cards are often successfully sold via direct mail, direct response TV advertising, in shopping center intercepts (direct selling), and through retail store partners (such as department stores). It would be quite unusual for the other banking sub-markets (such as home loans) to effectively use these particular distribution channels or promotional techniques.